All I can say is WOW! Are you a Nutella Lover? Well then I suggest you make these right away. 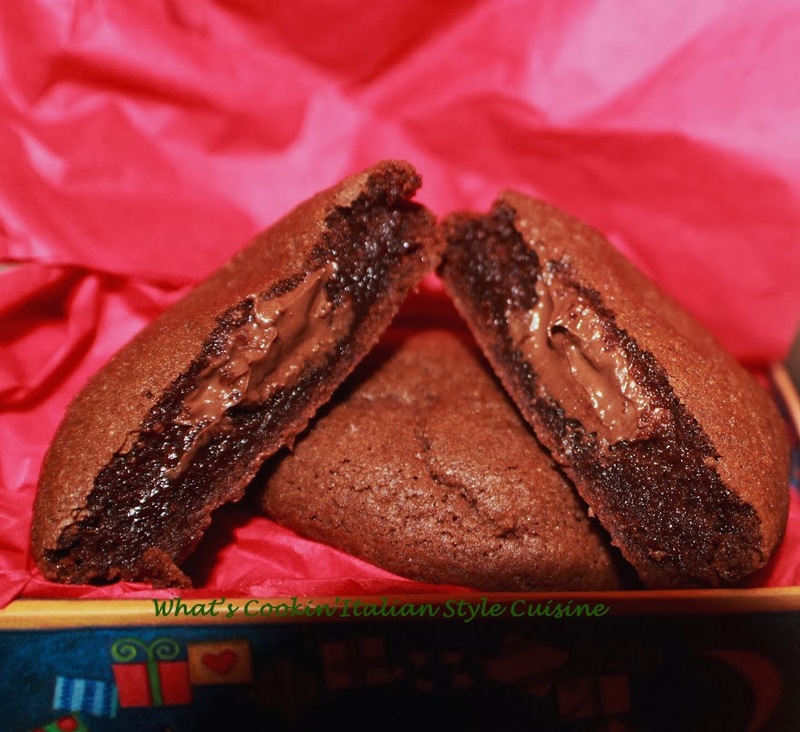 Buttery flavored tender chocolaty cookie bursting with the best surprise inside to ever be awaiting for you. Yep you guessed it Nutella. So get in that kitchen and start baking your going to love these and the picture doesn't do justice to the taste of these, I totally am in love! I have made them with peanut butter and not such as huge of a fan as I am to Nutella and believe me this is not an ad promotion for that product, I just love the stuff. Ever tried it homemade? Here is a recipe for homemade Nutella, you can make if you can't get this where you live. Preheat oven to 350 and prepare cookie sheet with parchment lining or silpat mat. Beat the sugar and butter together until well blended in a heavy duty mixer. Add the eggs, cocoa powder, salt, baking soda and flour. Mix until it forms a ball using the flat paddle from the electric mixer. 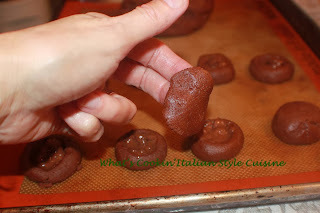 Roll small amounts of cookie dough into a ball, make an indent in the center like a well to fill with you finger. Fill with Nutella, I used a small baby teaspoon. Top with a small piece of flattened dough on top to seal. Bake for 10 minutes on 350 degree hot oven. Do not over bake. Cool in pan 5 minutes before transferring to a wire rack. You can dust with powdered sugar or even drizzle with melted chocolate. These cookies are a Nutella's lovers dream!